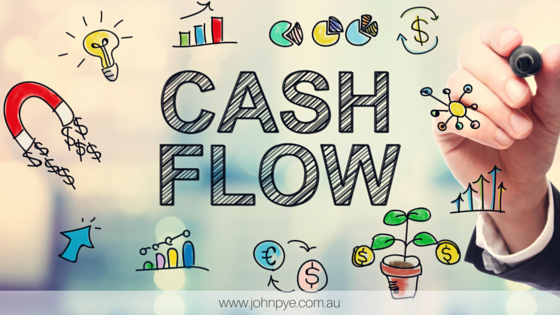 Want the secret to future cash flow success? home > Marketplace News > Want the secret to future cash flow success? Investors often question what the real cost will be to hold a property they are considering purchasing. It is important to ensure that their purchase provides them with the maximum cash return. There’s a myriad of expert advice available and every individual investor has their list of what the property they are looking for must include. Astute investors consider the potential rental return of the property, the property’s location in proximity to local services and facilities, local employment drivers and historical growth of properties within the area. While other investors limit their options by only looking at properties within close proximity to their home. To get a true calculation when making a decision to buy a property, investors should also work out the tax deductible costs and other deductions involved in owning the property, such as property management fees, rates, interest, repairs and maintenance and property depreciation. The amount of depreciation available varies significantly from property to property and can be difficult to estimate. Because of this, investors often fail to consider the financial benefit of claiming depreciation prior to making their purchase. By incorporating depreciation calculations into research conducted prior to making a purchase, an investor may actually find the property to be more affordable. Vanessa and Greg have been looking to buy a townhouse as an investment. A property they have recently seen listed, a two bedroom townhouse on offer for $495,650, is in a great location close to schools, shops, public transport and a park. Before making an offer for the property, Vanessa and Greg have completed some preliminary research by asking their agent for a rental appraisal of the property. This appraisal found the property to have an expected rental income of $505 per week, or $26,260 per annum. Vanessa and Greg also estimated what costs would be involved in owning the property should they decide to go ahead with the purchase. Costs such as interest, property management fees, rates, repairs and maintenance totalled to $35,639. Aware that once the property became income producing they would be entitled to claim depreciation deductions for both the building structure and the plant and equipment assets, Vanessa and Craig contacted a Quantity Surveyor for a depreciation estimate. The Quantity Surveyor found that they would be able to claim approximately $9,500 in depreciation deductions in the first full year. This example shows how including depreciation in the numbers prior to making a purchase can really assist the buyer to make a more informed decision. 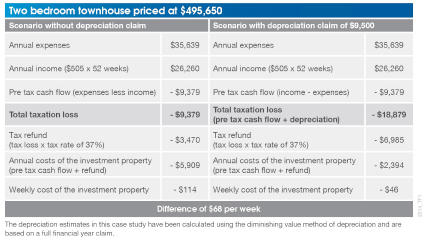 Without depreciation, the property investor would experience a loss of $114 per week during the first year of owning the property. By making a depreciation claim, this cost is reduced to $46, saving them $68 per week or $3,536 in the first year of ownership. Once an investor has made their purchase and the property becomes income producing, the income earned from depreciation can make a big difference to the owner’s future cash flow. For a handy application to get an estimate of the available deductions for an existing or a potential investment property, simply visit www.bmtqs.com.au/tax-depreciation-calculator. Alternatively, property investors can ask the expert staff at BMT Tax Depreciation for advice on the depreciation deductions available for any property by contacting them on 1300 728 726 today. Bradley Beer (B. Con. Mgt, AAIQS, MRICS) is the Chief Executive Officer of BMT Tax Depreciation.